mromecki.fr | What's Haxe, Neko and SWHX ? 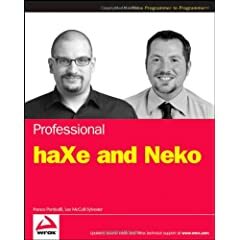 Haxe has a common API used by all the platforms and specific API to flash, js and Neko. With the conditional compilation, you can write one class file that works on all platforms ! It's an ambitious project written by the famous MTASC creator, Nicolas Cannasse and still in progress but quite stable for now. You can learn more about Haxe on its dedicated site http://haxe.org, read news on the http://blog.haxe.org, and see archives or join the Haxe Mailing List. SWHX is an opensource fork of Screenweaver, a flash projector, that enables you to create complex desktop applications, using Flash for the interactive part and Neko for accessing system layer. Take a look here for more informations about it.